A fine word of praise. But what does it have to do with New Order stock, you ask? Purchasing shares in the New Order--it's the very definition of "friendship". In other news this week, The Lawton School for Pubbies Who Can't Mine Good continued its steady acquisition of more stock, this time purchasing a block of 5,000 shares and taking us past the 1,712, 1,713, 1,714, 1,715, and 1,716 billion isk marks. The fine academic institution has earned a Quintuple Supreme Protector's Tip of the Hat™ to add to its long list of accolades. Xan Staraider also made a significant upgrade to his holdings. 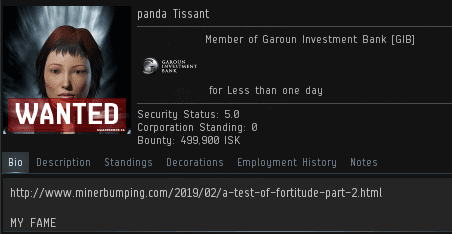 Xan's solid purchase of 1,000 shares guaranteed that we would pass the 1,717 billion isk mark--and also guaranteed Xan the honour of a Supreme Protector's Tip of the Hat™. Sometimes people wonder what happens after rebellious miners find themselves written up in MinerBumping posts. 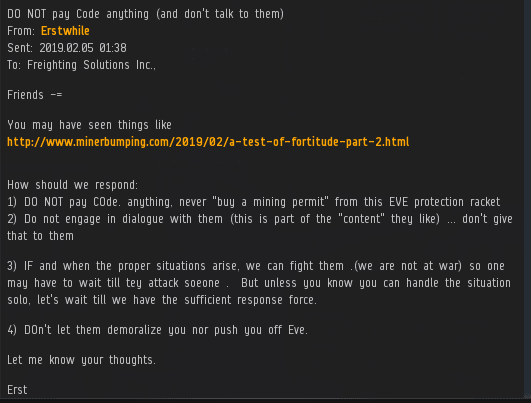 Agent Aiko Danuja reached out to panda Tissant, the mouthy miner who was recently featured in the A Test of Fortitude series. It appears the corporation that panda belonged to, Freighting Solutions Inc., didn't like reading about panda's exploits on MinerBumping. These guys sound like a barrel of laughs, don't they? panda was hauled in for a meeting with HR, and after spending a half-hour being yelled at by corp leadership for "bringing unwanted attention to the corp", she decided that Freighting Solutions Inc. wasn't for her. To be honest, the corp didn't really draw our notice--not any more than any other corp with non-compliant miners. But they certainly have our attention now. So many new faces. The New Order is growing! Panda should get a permit and come create content with us! How delightful! Shares in The New Order always make for a wonderful gift. Eva Solberg was the first CODE agent shooting at me. what a great experience this was, thank you Eva. Come back and help us share this experience with others. That is a lot of ag failure. Wonderful! The very people you might have expected to rally around panda instead chose to reject him. Carebears, especially carebear corp CEOs, are only loyal to ISK. Miners regularly discover, to their amazement, that their local Knight of the Order is the only one in all of New Eden who cares a whit about their well-being. All that's left now is for panda to embrace the Code and enhance his bio with a shiny new mining permit, and his future will be secured. 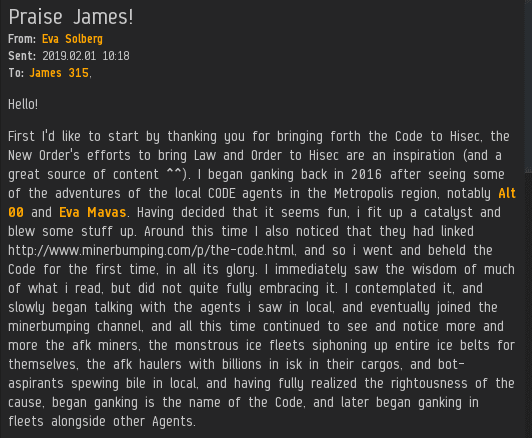 Well whatever, praise James and the New Order of Highsec! Not kicked, think of it as being elevated slightly above the swamp. My carebear guardian blocked me when he found out I joined CODE. Something about him and Eva Mavas, years ago, some kind of dispute over a half billion isk pod. They do that when they fear you.